Need some help about this show. I just downloaded the first episode but for some reason the OP and ED is not there. My only guess is that that the OP, ED and main show was separated in three parts. How can I watch this normally w/ the OP and ED included? Any help is very much appreciated. Thank you for your time. 720p isn’t horribly taxing, but it’ll run just fine if you’ve got a fairly recent GPU, since it should have hardware video acceleration for this codec. If this is 10-bit though, you might have trouble with it since no consumer GPU’s currently available support 10-bit video decoding, so your CPU has to do all the work. Though for 720p, I imagine even a Pentium 4 would play this just fine, as long as it’s one of the later series. Have you guys been knowing corruption in the files? I forced a recheck and it’s adamant in saying its 100% Some files I’m having at the trouble are the OVA from 25:30 – 26:04 (OCD about the condition/quality of the files) and both the Play All files. The OVA corruption is just a sudden visual crash for the video, while the audio continues after skipping a few seconds ahead. As for the Play All files, it likes to skip ALOT of times, as if the chunks of time just weren’t there. For example, skipping as early as 00:23 directly to 00:43. There is artifacting and then there will be times were the audio continues while the video freezes for some time. I don’t even know how the others will be since they’re not finished being downloaded. I wanted to know if it was corrupted as an original or somehow it was just me getting corrupt copy. I’m pretty sure playback is set correctly since I followed the instructions on the site. If it’s just me, could someone also tell me the way to repair the file, or a link to a direct download of those specific episodes? That would be awesome, thanks. Ahh, sorry for my inexperience. I had the assumption that .mkv was a strictly video format, I had no idea it could act like a playlist, sewing all the videos together. It finally made sense to me when I noticed that the jump corresponded between the original and the play all files. As for the OVA, I deleted the corrupted video, force-rechecked and got a good copy now. Thanks for all the work you guys put into this, it’s fantastic! Thank you. Thank you, Thank you so much. thanks for the great rip. The ddl was taken down! Can you please reupload it, or can someone who has all the episodes send them to me? thanks! Thanks!!! Awesome quality, although whenever I play the Play All files nothing seems to be happening. I can play all of the episodes fine but without the OPs, EDs and previews. Anybody know why this is happening? I’m using MPC-HC btw. ^Problem solved. All I had to do is disable MPC-HC’s internal Matroska filter. It now plays the Play All files. Hi there Coalgirls! Great series, and great rip. I had an interesting question though. 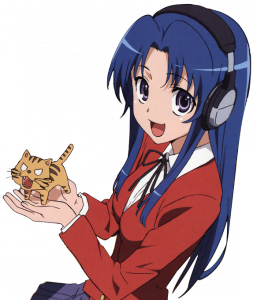 I have another 1080p BDrip of Toradora and would love to watch it too, but there are no subs. Is it at all possible to copy the subs from your rip and use them for the 1080p version? If so, how would I do that? Otherwise, do you guys plan to ever release a 1080p rip of this series? Hi coalgirls, i have a problem regarding the “play all” files. Whenever i try to play the “play all” file it only shows a black screen with only 5 seconds of video. Its the same thing for the rest of the “play all” files and i would really appreciate it if you would help me fix this problem. I have the the newest version of MPC-HC. Please reply, i really like this anime and it just crushes me that i cant watch it from beginning to end. Screenshot comparison is down. Care to fix it, please? Thanks! • Right before the ending plays, the audio mutes for 1 second before returning back to normal. • Before the previews, it sometimes shows a little clip of the scene before the ending begins, but without audio. may I ask how they make this file? At episode 21 it replays a part of the last scene instead of the ending, which Really kills the mood there (one of the best scenes in the whole series). If you care to fix old projects, please do. I’d like to rewatch this a third time. Great release, thank a lot! Just one question… any chance of a 1080p release in the future? No. The Blu-rays were SD upscales. Hey just a small issue when playing. I don\’t know if its intentional or not. After every episode (even during the credits, sometimes before the credits, etc) the anime does quick flashback to the end of the episode for a few seconds without any sound and then cuts back to the credits. Is this normal or a problem on VLC? If you have any other media suggestions I\’m willing to take them. This has been happening on almost every show I have downloaded from here.